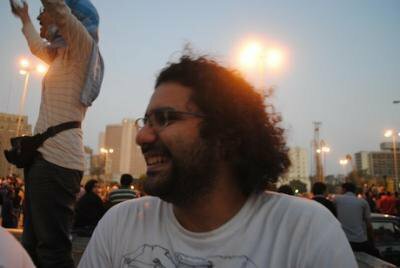 Alaa Abdel Fattah, a prominent Egyptian blogger and activist, was arrested on 28 November 2013. This is a letter he wrote on 24 December 2013, from his prison cell to his sisters. openDemocracy is honoured to publish this letter to remind people on January 25, the anniversary of Egypt's revolution, of political prisoners everywhere. Alaa Abdel Fattah in Tahrir Square. Wikimedia/Lilian Wagdy. Some rights reserved. I miss you a lot, though I see you more when I'm in prison than when I'm free. Maybe because when I'm not in prison I'm able to check up on you any time and to follow and understand your news. When I'm in prison we have to decide how we spend your short visits, which news we talk about. We split up the time carefully and of course I never get to hear all the little things that make you Mona and Sanaa. Mona's fights on Twitter or the romantic phases she goes through, whether Sanaa watched the latest Ahly match or the adventures she stumbles into. This may be the hardest thing about being imprisoned, that someone else controls your time to this degree; to the point where you're even deprived of the right to worry: because I’m not going to know if Khaled's come down with a cold until after he's got better. That someone else controls the alignment of our feelings. For example, the snow storm...I got the stuff you sent to help me - only after it had ended. The whole country spent 4 days talking to each other about it, but by the time you came to visit I could only tell you that we'd dealt with it and that we’re OK; we weren’t able to even talk excitedly about how cold it had been. When I put all my clothes on together and laid my blankets on top of each other I thought that there are people who live in shacks or on the streets and that they have less clothes and less blankets than I do. But after the coldest night, when I decided that I had to block the windows in my cell, I realized that even the homeless can get up at any time they choose and try to deal with the cold. They may find a solution or they may not, but the feeling that an authority decides with bureaucratic randomness when to open my door or when I might find a bit of cardboard to block the window or when the guard on duty will get permission to bring a ladder so he can climb it and block the window is so oppressing that it hurts. And I don’t know who it was who walked all over downtown to find a store that still sells a single frequency radio and why anyway should they have to? But all these are just annoyances that confirm the idea of imprisonment: that your will is completely taken away from you and someone else controls your time and your body. The problem is that he controls my soul, he decides when I get to see Manal and Khaled and how much I can kiss and hug them. And what's more scary is that it could become less. If I'm sentenced my visits will be every two weeks not every week. Newspapers talk about a new system where visits are through glass cabins and telephone lines. If this happens I won't be able to touch you. How can I connect with Khaled like that? And what's truly miserable is that people who were reasonable just yesterday now write articles urging that wives and children's visits should be barred to stop the Muslim Brotherhood giving out orders and assignments! As if the prisoner isn't a human being in the first place. Or those who're still pretending to be reasonable and writing about how the verdicts of Maher, Douma, and Adel are a result of the wrong political decisions taken by April 6th and the loss of their popularity, as if Ahmed Maher is just an idea or as if the man they've imprisoned is a theoretical entity named April 6 not a human being who has a 5-year old daughter to whom he's having difficulty explaining where he is and why he's not with her and when he'll be back. Anyway, reading the newspapers has become irritating; it's different from the other times I've been in prison - but it passes time. One result of having someone else control your time is that you have a lot of time you don’t know what to do with. Don’t be startled at my words, our conditions are good and - compared to previous stretches - we're comfortable. During exercise time, we're together, half the day, we spend yelling to each other through the cells, and reading helps time pass. With negotiations, conditions improve. We negotiated for a week for newspapers and radios, and now we're negotiating about letters. They promised us this letter would reach you and we've been negotiating for weeks for the right to publish articles and to get TV sets. Maybe one day they'll let you bring in letters from friends and they'll deliver telegrams. I feel that I’m Saeb Erekat, life is negotiating. Life goes on, but the oppression of the soul is difficult. The day that they broke into the house and arrested me, Khaled was sick and couldn't sleep. I took him in my arms for an hour till he slept. And frankly, what's completing my pain is the sense that this imprisonment serves no purpose. There's no struggle and there's no revolution and the people who're in negotiations now even though they're not in jail aren’t worth me giving up one hour with my son in my arms. In the past it made sense that I should be imprisoned and hold firm. I felt I was in jail by choice and I came out of it a winner. Right now I feel I can’t stand people or the country and that there's no meaning for my imprisonment other than freeing me of the guilt of my helplessness to confront the excess of injustice and the excess of justification of it. Yes I am still powerless, but at least I've become oppressed among the many oppressed and I no longer owe a duty or need to feel guilt. To be honest, one hour with Khaled is more use. I don’t even understand how I can live without him and I've never understood how I'm able to live without Manal. When we got news that they'd put out a warrant for my arrest Manal started to try and make practical arrangements so our work wouldn't be held up and I got very tense with her and with a session we had with Maysara trying to hand over some of my work to him and to agree with her who would take over the rest of my responsibilities. I knew - like she did - that I was going to be locked up but I didn't want to or know how to think how our life could carry on when we weren't together. But, in the end, it does go on; the fact that my will and my control over time have stopped doesn't mean that time itself has stopped. The thought is terrifying: I'm facing two criminal charges and it's clear that they've decided that we must be convicted and sentenced. It's clear that the revolution is in such a miserable state that they can do this. So time might stop for me and carry on for you - for years, so Khaled will grow up without me, and have many more colds where he'll sleep without my arms around him. Or maybe not. Maybe I'll come out after a month or two, or maybe I'll come out when they've completed their damned transition plan. It's up to them and time is under their control. I'm sorry for the gloom…You know I hate the whole “Brother, you are free behind the bars" and how great it is to be in prison and how prison won't break us. Each time I go to prison a bit of me breaks, just like every time someone else is imprisoned, a bit of all of us breaks, just like when any martyr dies everyone bleeds - yes his family and loved ones bleed a lot more, but everyone bleeds and everyone pays the price. I'm well. You know that this oppression of the spirit is something I've been living with outside - as you have. Every day brings news that wrings the heart, and there's a passiveness out there that is suffocating. I have so much time here that I don't know what to do with, I focus on this oppression thing more than I should. I'm just fed up, but this will pass just like the times before it passed and I'll go back to seeing you less and missing you less because Mona will be busy with her fights and her romance and with balancing her many roles and Sanaa will be busy with her many mysterious projects and the many marvellous adventures that she has without noticing and I'll be busy with Manal and Khaled and with new causes for anger and resistance. We would like to thank May El-Sadany and Ahdaf Soueif for the translation.